From Central Europe, I was heading to Egypt. Usually, there are three options for this route. The classic route would’ve been to go through Italy, Sicily and then onto Tunisia, across Libya and into Egypt. However, the Arab Spring was in full swing in Libya by early May and it was off limits to any outsiders. The other overland route was to go through Turkey, Syria, Jordan and into Egypt at the Sinai Peninsula. But it was now Syria’s turn to oppose their regime and the violent crackdown from Assad meant riding through Syria was a highly risky endeavor. And besides, I was running out of time on my European visa to go that far east before turning for Egypt. 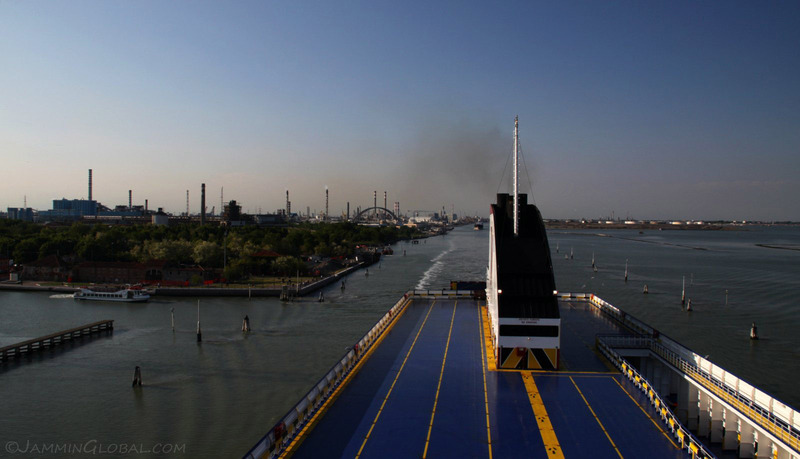 So, I took the third option – the recently running Visemar Ferry service between Venice and Alexandria. I was lucky that this third option was still available to me as the ferry service was losing money and they planned to stop running the route a few weeks after my journey. It was a three day journey across the Mediterranean Sea and I enjoyed being back on the water again, that too with an Italian crew. 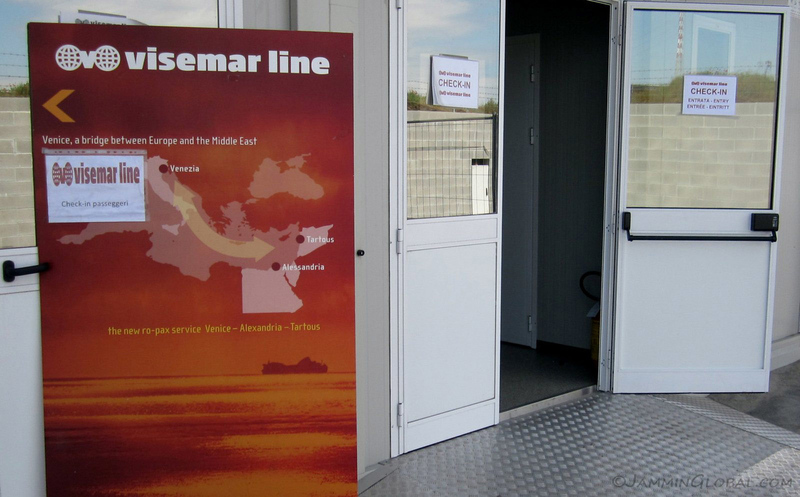 The check-in office for the Visemar Line in the commercial port of Venice. 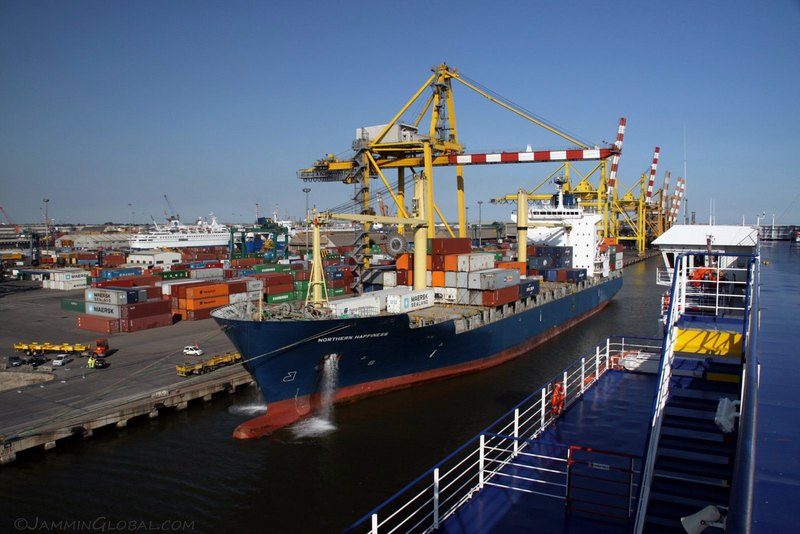 The shipping company is using Venice’s historical role as a bridge between the Middle East and Europe in its tag line. 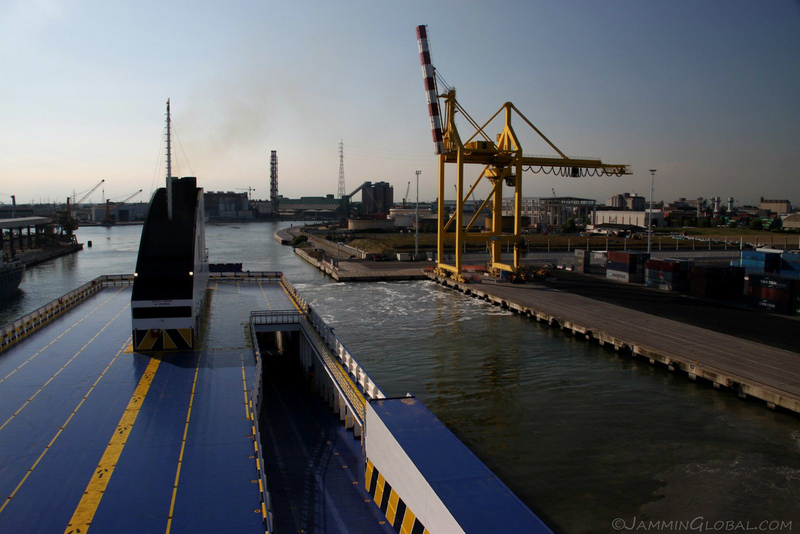 The service usually runs from Venice to Tartous in Syria and then onto Alexandria. However, with the Syrian uprising turning deadly, Tartous was dropped from the service and hence we saved one day in our journey to Alexandria. 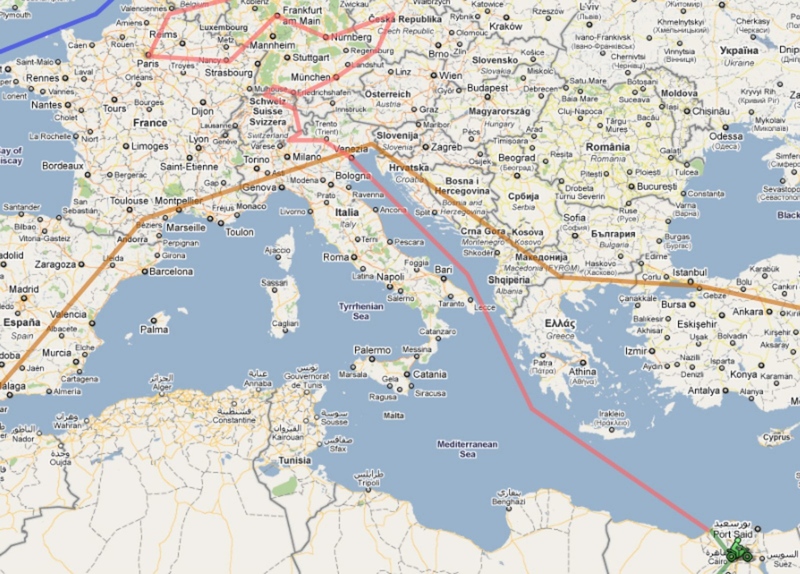 The route across the Mediterranean Sea from Venice, heading down the Adriatic Sea between Italy and Croatia and then through the Ionian Sea, bordered by Albania and Greece, across the Libyan Sea and into Alexandria. Click on it to go to the interactive version in Google Maps. 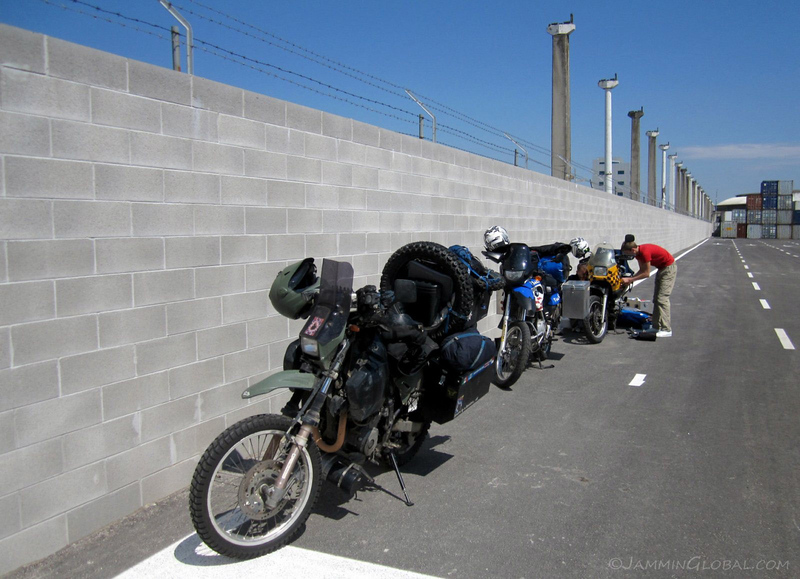 My company for the journey would be these two young Dutch bikers, Ralph and Martijn (Mar-tyn) who had three months to get to South Africa on their BMW F650s. …La Polizia to finally show up and stamp our passports out. Visemar told us to check in no later than 11 am and once there, they said the Police (Immigration) will show up at 1 pm. 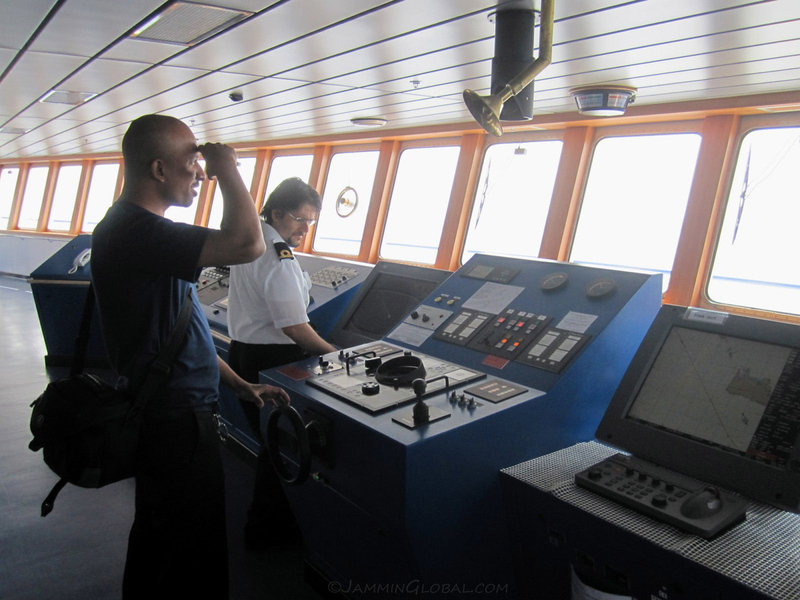 Riding onto our ship the M/V Visemar One. 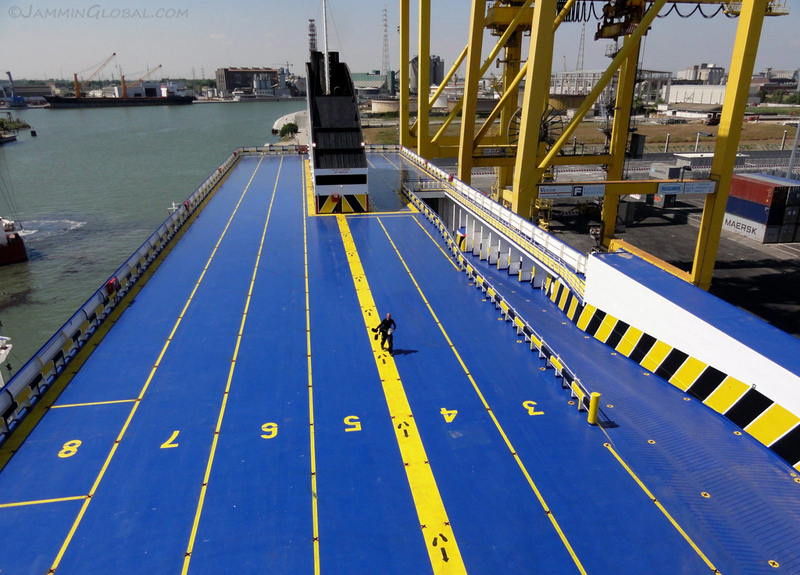 Cars get to go onto the top deck while trucks and bikes go in the hold. 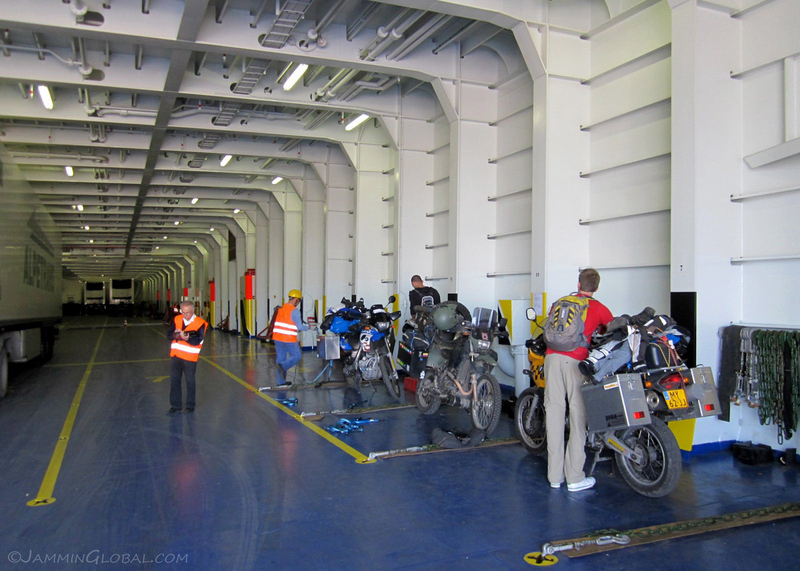 The chief mate (center) monitoring the loading of cargo as we strapped down the bikes. It was reassuring to see that they knew how to strap a motorcycle properly. 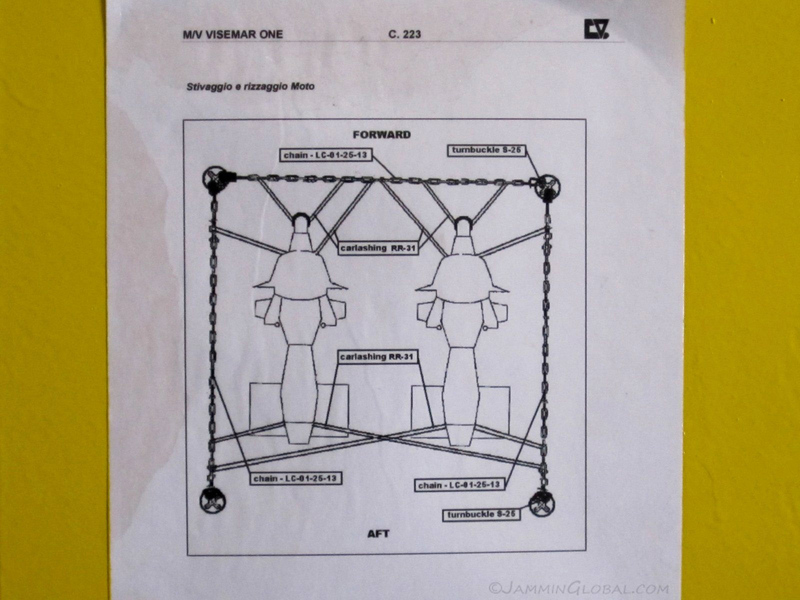 I think it’s quite clear from the diagram who their usual customers are: BMW R1200GS’s (deduced from the boxer engine). 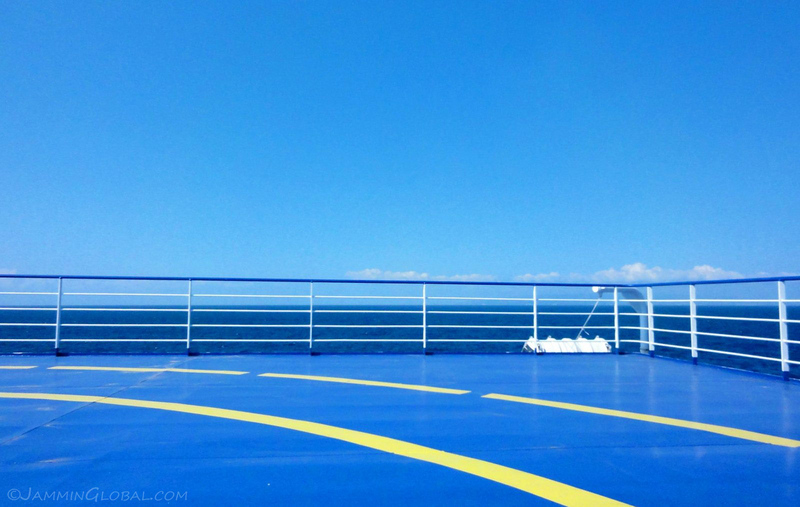 No, it’s not the on board swimming pool, but the top car-holding deck. 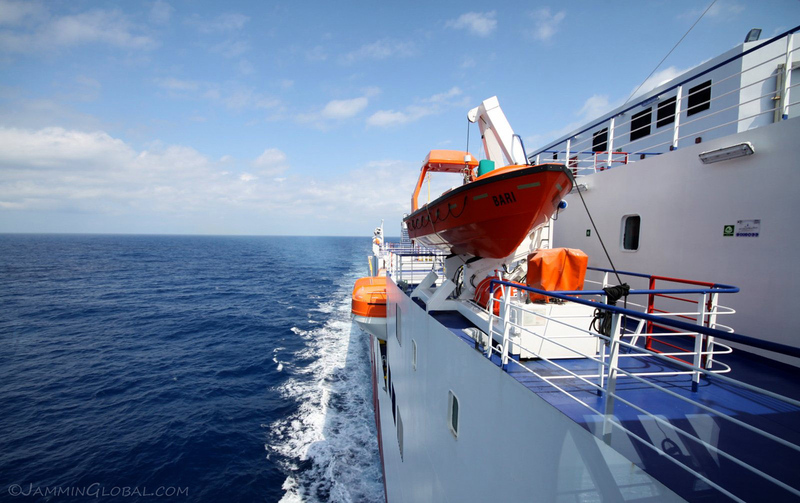 As we carried our stuff to the accommodation deck, it was immediately apparent that the only way they were making money was by the transport of cargo, especially refrigerated products, as there were so few passengers on board. Besides us 3, there were 4 adults and a child on this massive ship, plus the crew, of course. We set sail around 5:30 pm and were excited to get underway. 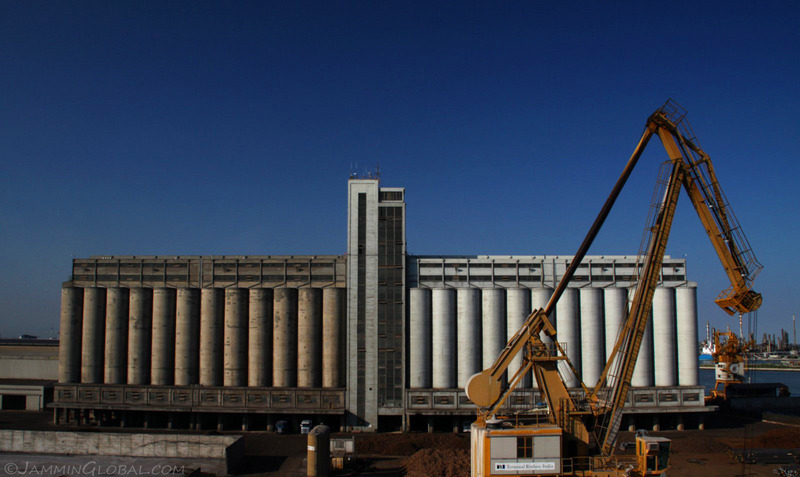 Enjoying the sights of a shipping terminal that I had missed from my Atlantic crossing with Grimaldi. 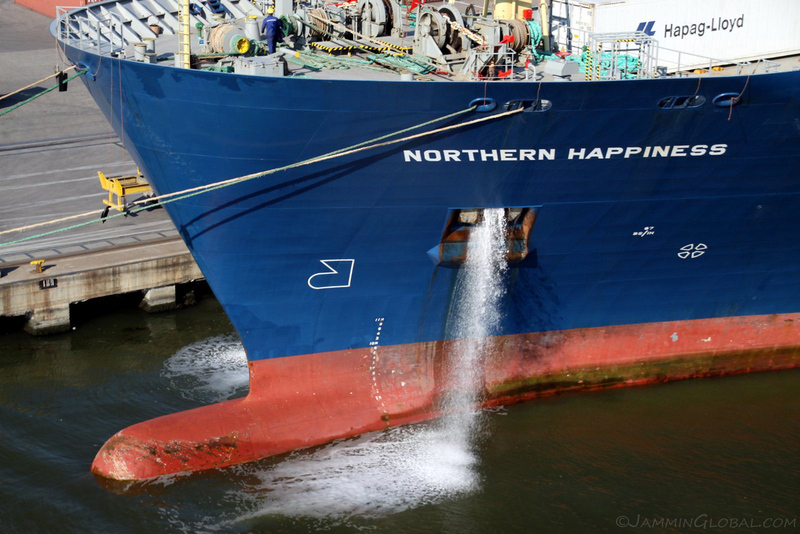 One thing that I realized on my travels through the world’s freighter industry is that every single ship is named and I guess, sooner or later, all the good names are taken up and some ships end up with some arbitrary names. Looking back at traffic as we exited the port. A sweeping panorama shot taken with Ralph’s camera. I was envious that he could just pan the camera in one sweeping shot and the software stitched in real-time a crisp panorama. 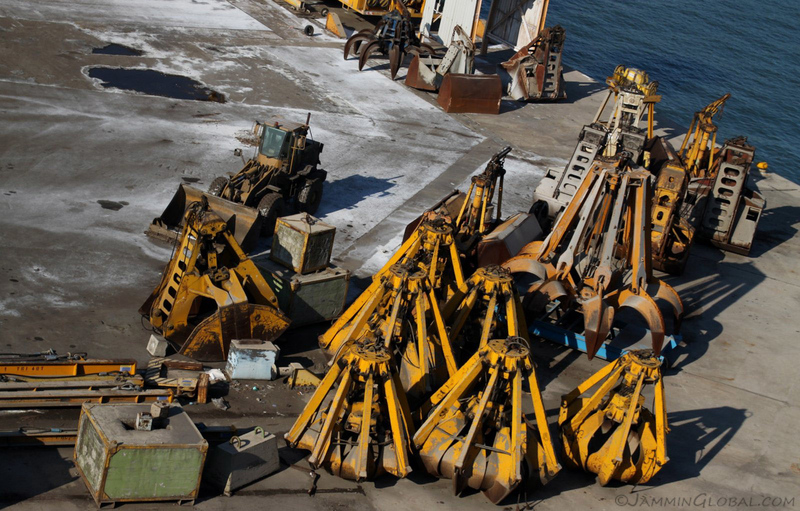 The eagerly awaiting cranes, that are a common sight in every big terminal. The cranes and their sturdy feet that roll along tracks. 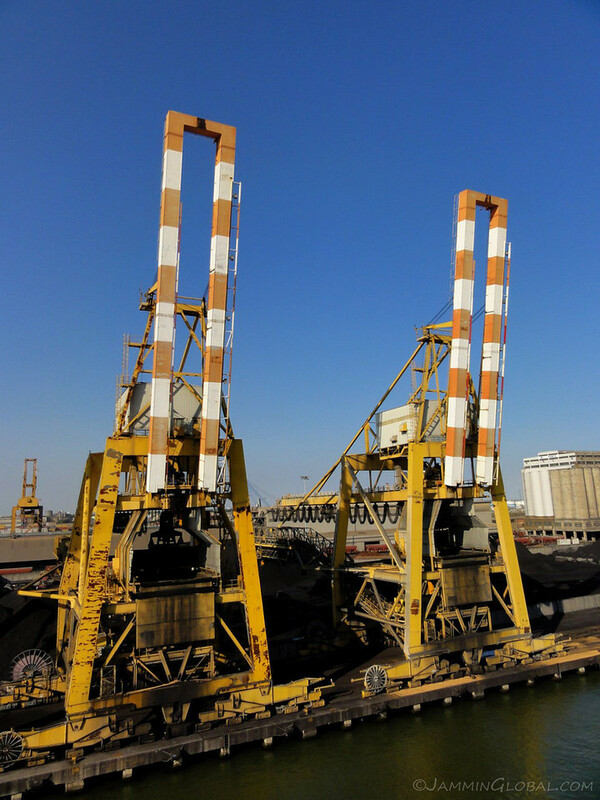 These cranes are in the business of bulk cargo, such as this black gold that runs every major economy in the world – coal. 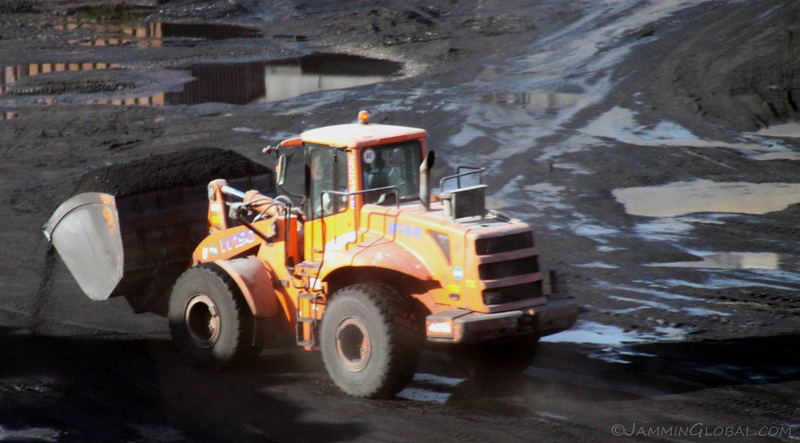 A surprisingly clean tractor in the dirty business of coal handling. Floating by this warehouse that had two faces, or two phases. 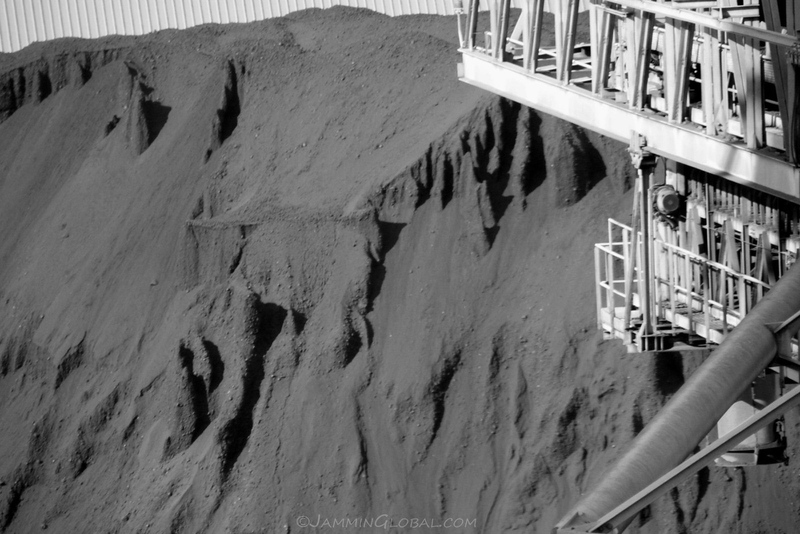 An assortment of giant hands for the cranes to grab at the coal. 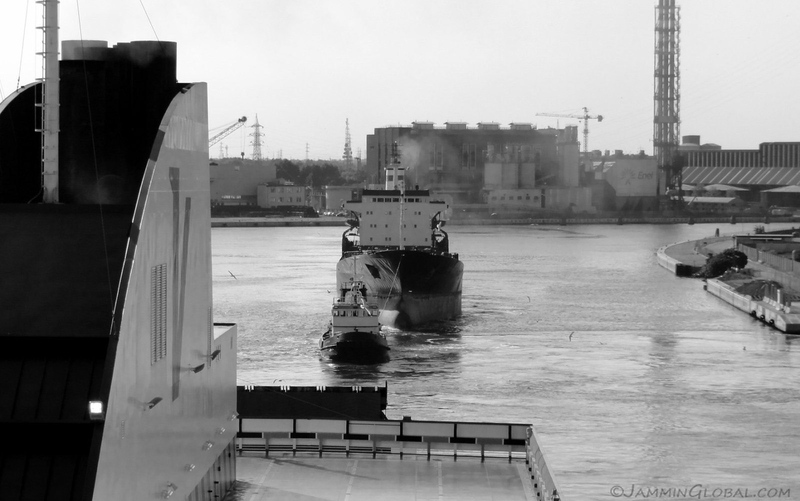 Turning the corner in the port and looking out at open sea ahead. 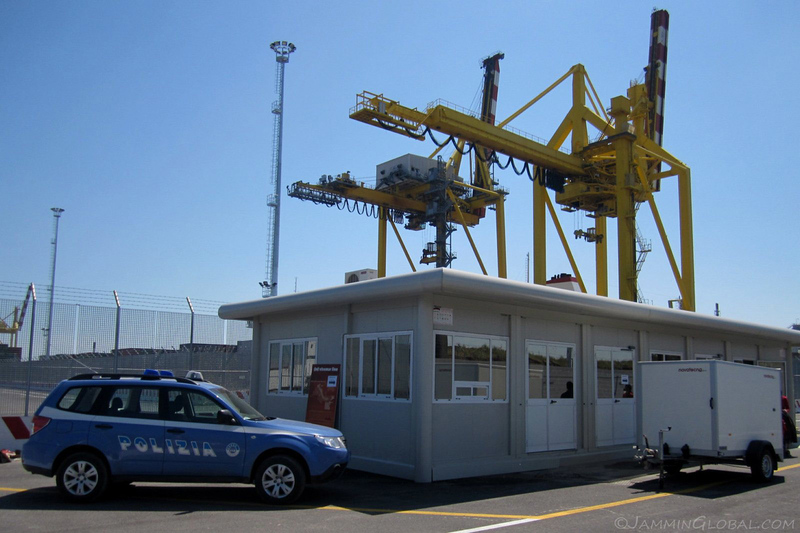 Italians and wonderful industrial design at Venice’s port. 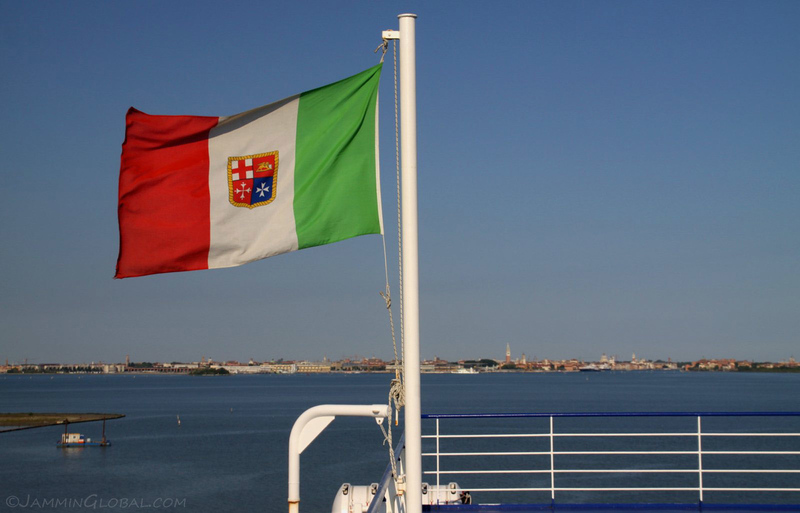 The flag of Italy flying full mast with Old Venice in the background. 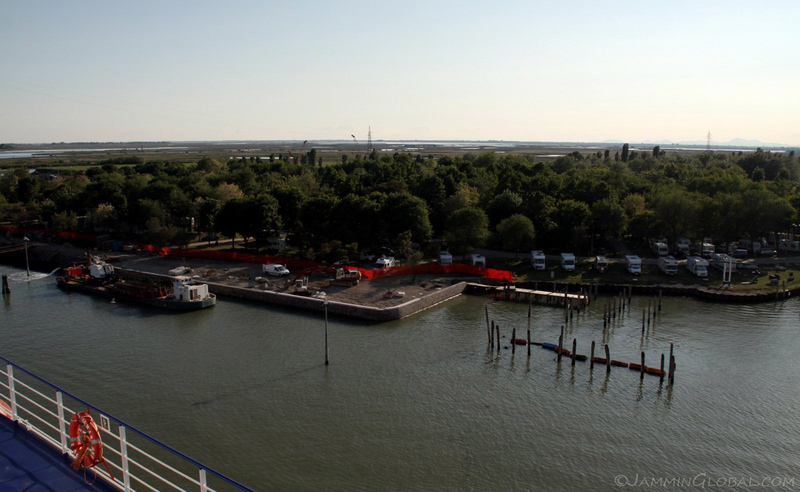 Passing by Camping Fusina, where I camped the previous night, my last in Europe. And with that, it was full steam ahead to Egypt. Bye-bye Europe. The next morning, we enjoyed some time in the sun, having the whole ship to ourselves. The only downside was that there were no deck chairs or any shade. 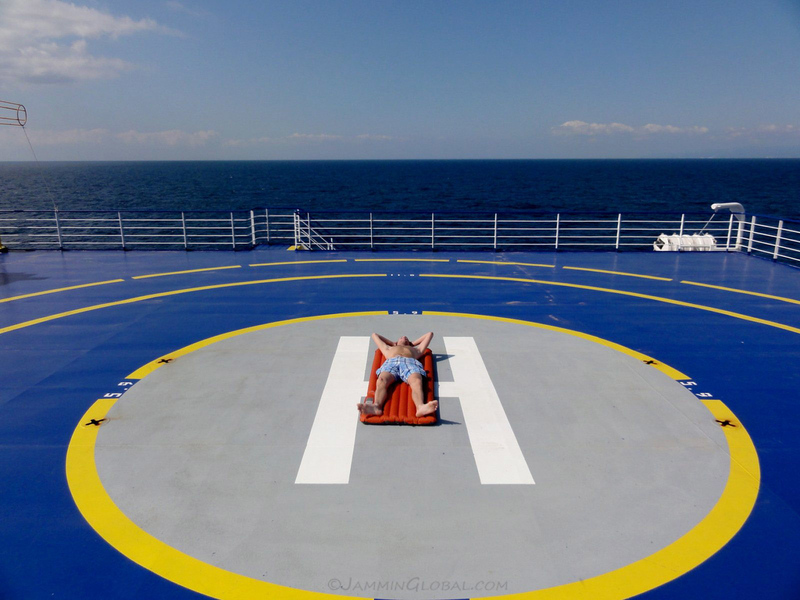 But that didn’t stop Martijn from catching some rays with his camping mattress on the heli-pad. 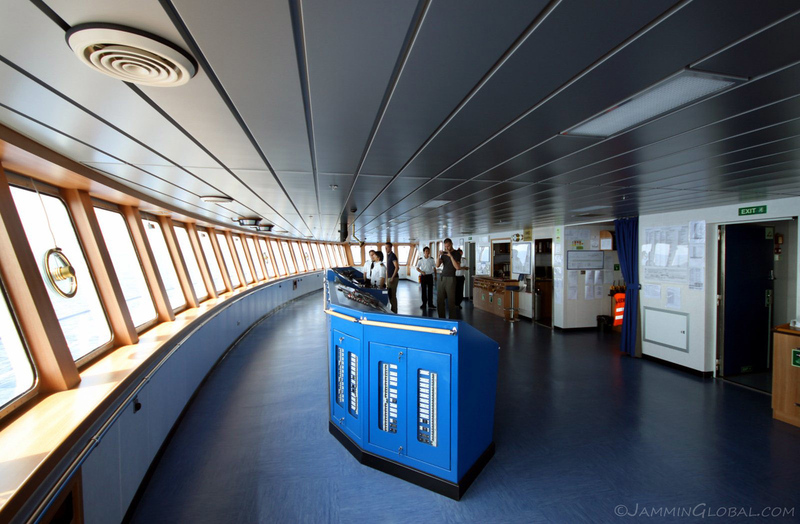 The ship had been in service for about a year now and we were amazed at the high quality of every surface on the ship. It looked brand new and no wonder with a crew constantly painting. 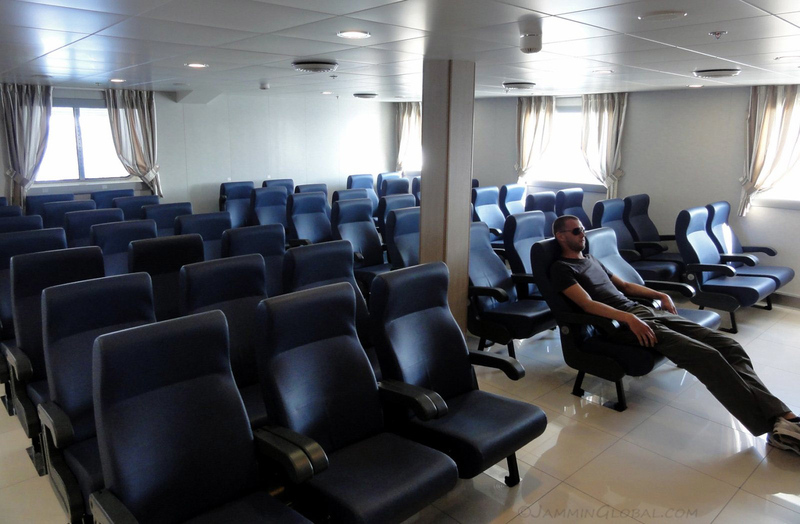 Either they really cared about the impression us 8 passengers had of their ship or they were getting ready to sell it. 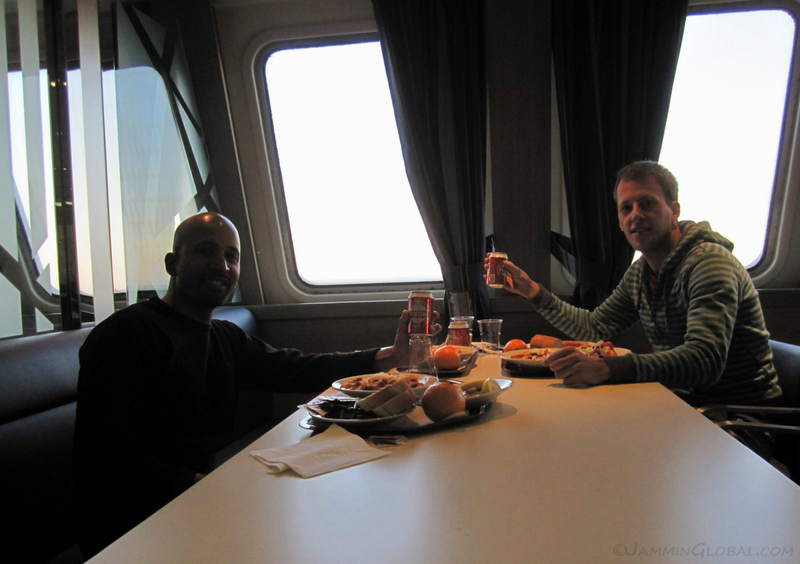 Having lunch with Martijn and Ralph in the cafeteria. The food was pricey but pretty good quality and really good quantity. A shot Ralph took of one our cabins. 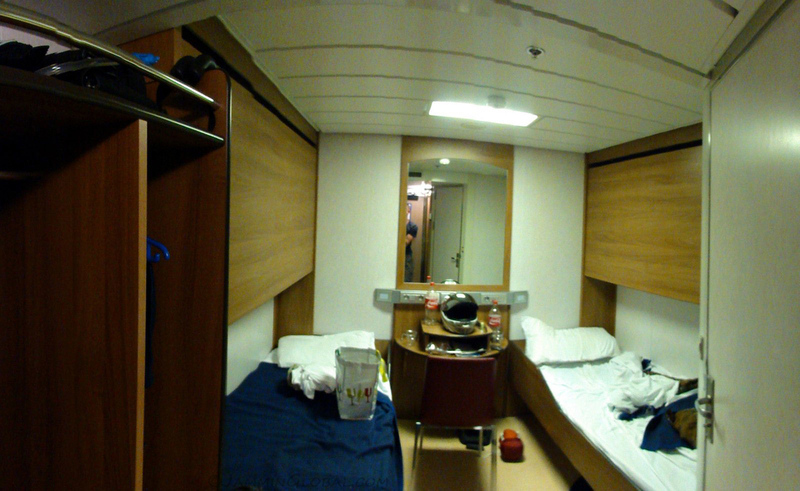 We had all booked the cheapest option, which was to share a room among four people but with hardly anyone else on board, they let each of us have a room to ourselves. Ralph pretending to watch a movie in the theater. This ship was much closer to a cruise ship than my Grande Francia that I spent 4 weeks on crossing the Atlantic (which I highly enjoyed). The setup, with a strong focus on entertainment with bright colors and a really noisy public address system (fueled by a talkative passenger chief) was a lot less enjoyable than my spartan Grimaldi experience. The chief would announce, in five languages, on the PA system when every meal was ready (that was set on a schedule) and then after the meal, he tried to persuade the passengers to make use of all the great facilities of his ship, such as the duty free shop and this movie theater. 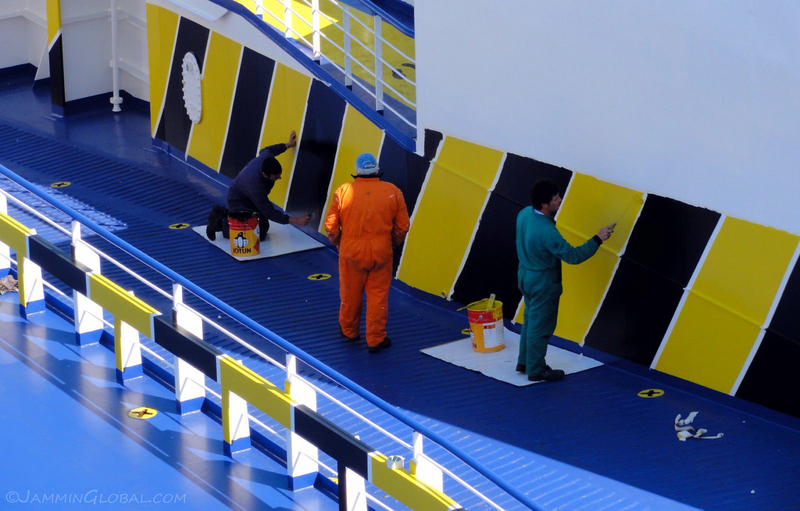 I think the poor man was dying to work on a Carnival cruise ship. 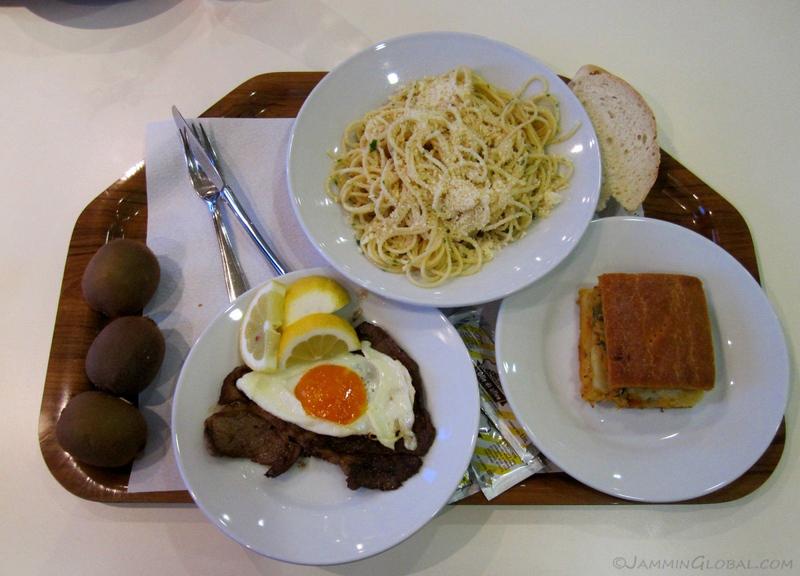 Dinner of spaghetti with beef, eggs and a toasted sandwich, along with kiwi fruit. 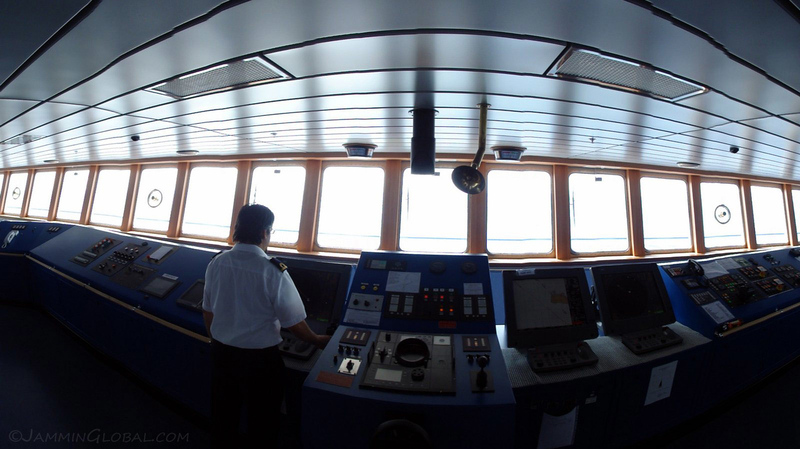 On the second full day at sea, we got a tour of the bridge, the main control center of the ship. 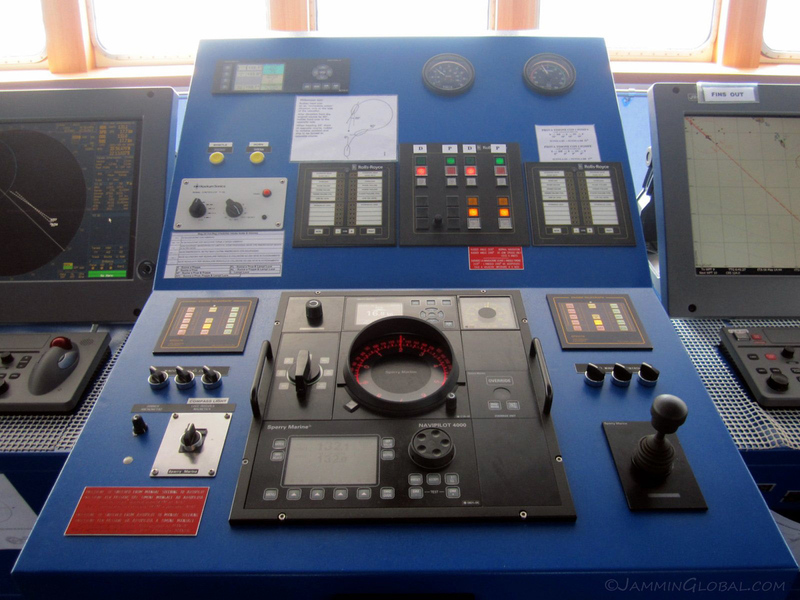 The principal control panel of the ship. 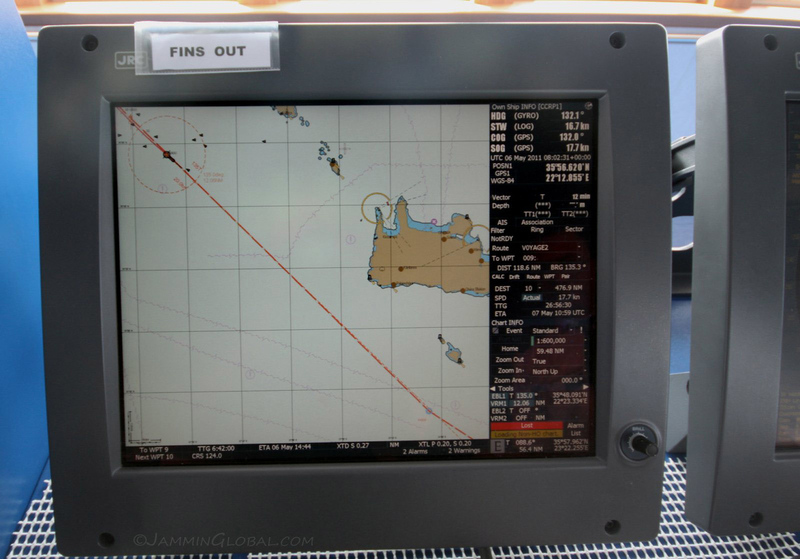 Our plotted route, going around the Greek island of Nisos Kriti (Crete), through the Libyan Sea. A wide-angle view of the bridge. 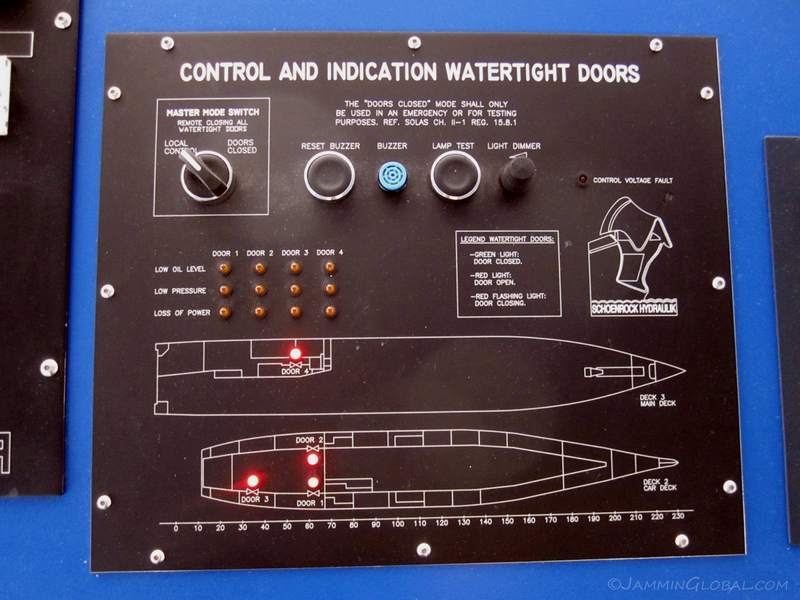 A panel indicating the status of the watertight doors. Ay-matey, I spot some pirates. 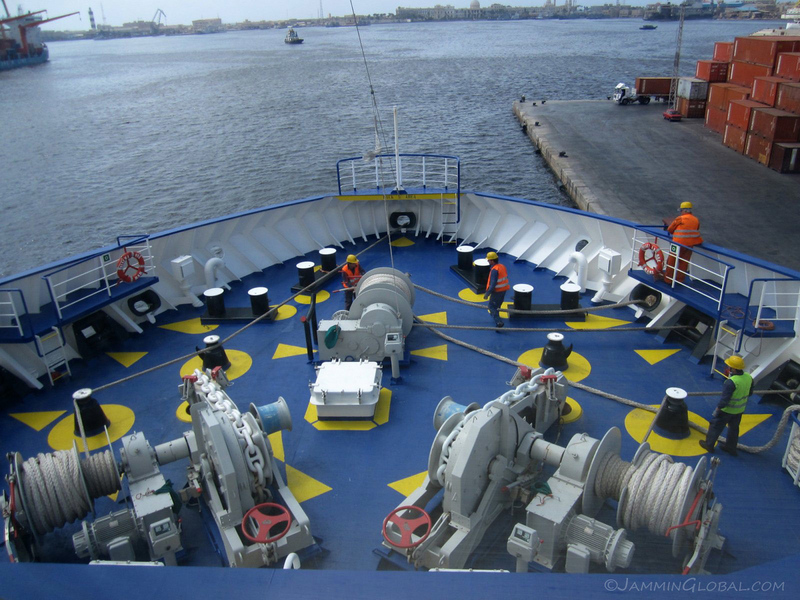 View from the bridge of the bow (front) of the ship. 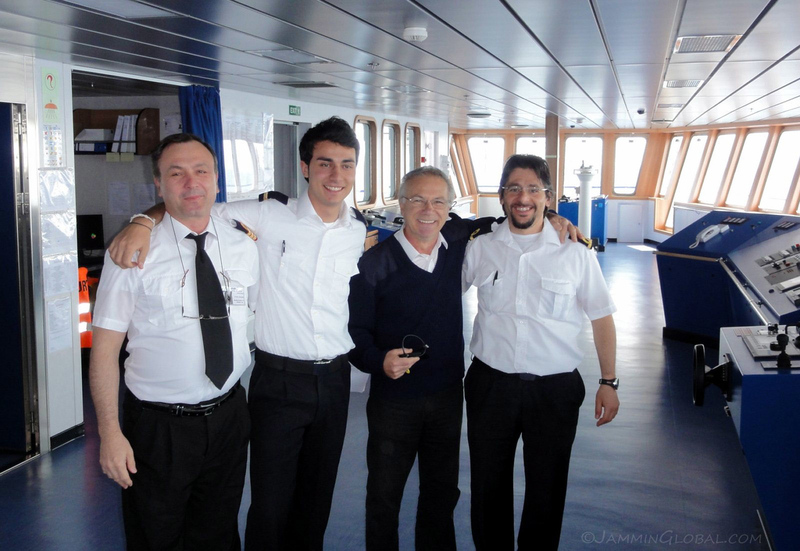 The crew on the bridge with our talkative passenger chief on the left (whom the chief mate wanted to kick off the ship), followed by a cadet in training, the chief mate and the first officer. 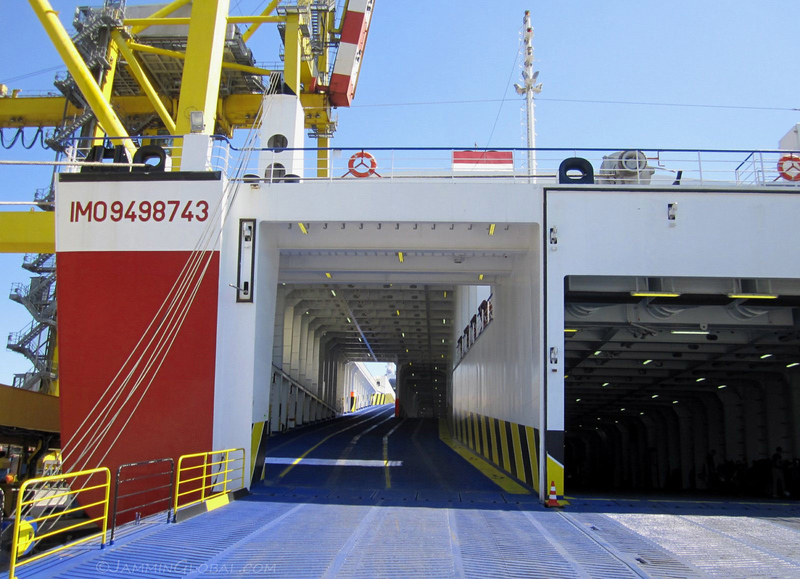 The bridge extended over the side of the ship so that they could see their dock as they parked the ship at port. 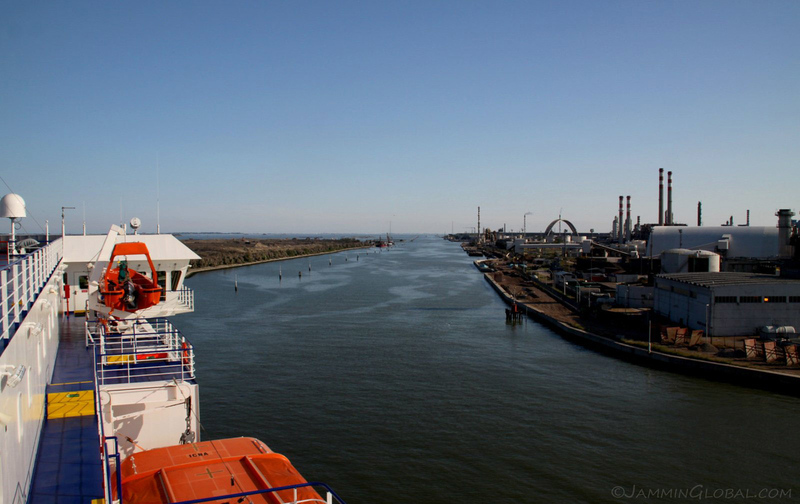 Looking back at the ship and its lifeboats from the bridge. 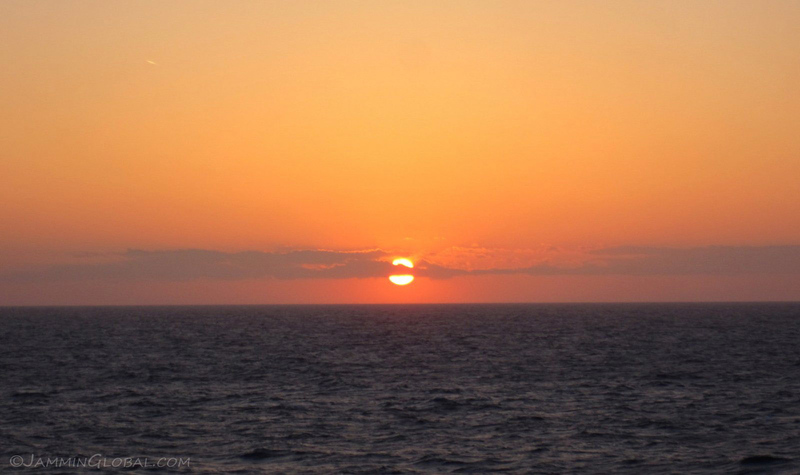 Enjoying an open water sunset that never gets old, on our last night on board. The beautiful Mediterranean Sea, which has actually dried up and been refilled by the Atlantic many times in its past, due to the repeated closure and opening of the Strait of Gibraltar. The last time this happened was about 5.3 million years ago when the entire basin filled up within 2 years of the waters returning. 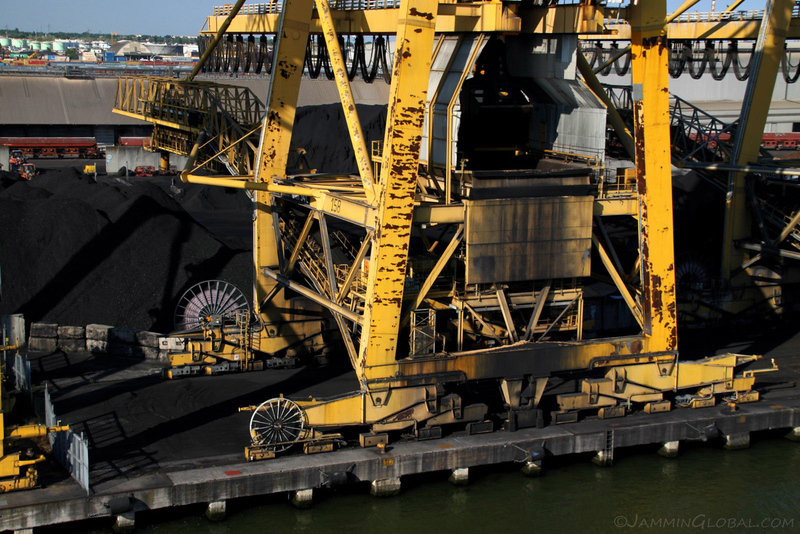 The sea is expected to dry up again in the near geologic future (but very far ahead on the human scale). 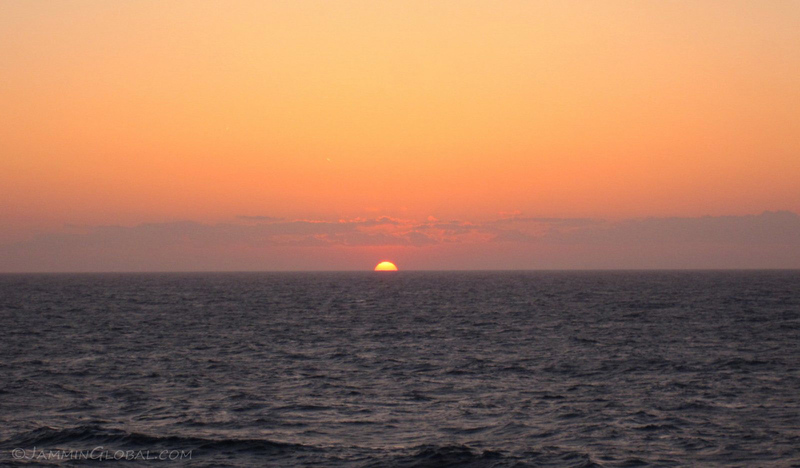 The last moments of the Sun in our horizon. 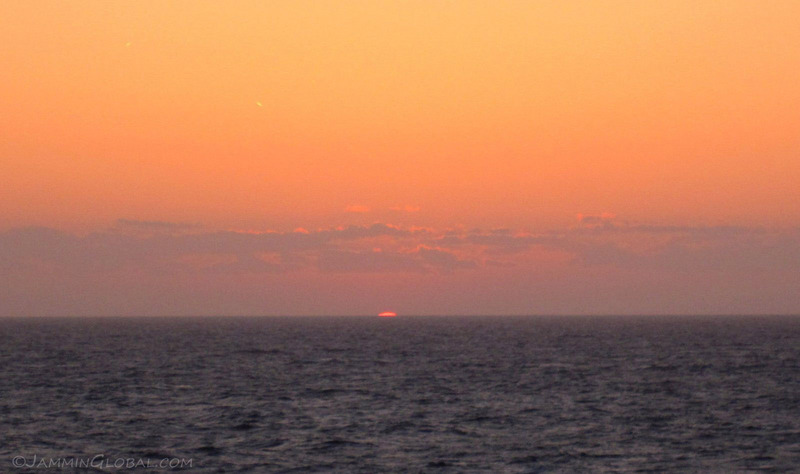 A solar sliver, hanging onto the Mediterranean as we headed south east to Alexandria. Note the two flares in the upper left of the picture, which are high-altitude clouds catching the sun’s rays from a very steep angle as it rounds the earth (or as we rotate away from it). 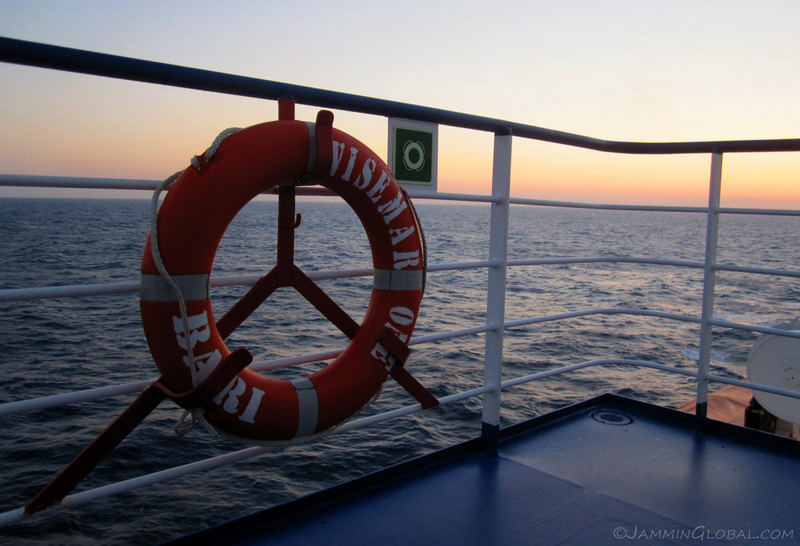 It was a good two days out at sea on the M/V Visemar One, who’s home port is Bari in southern Italy, near Naples. On the third day, we saw land. Not just any ordinary land, but Africa! The city of Alexandria with its new lighthouse welcoming its new visitors to the land of pharaohs as the great Pharos of Alexandria did for explorers and adventurers in centuries past. 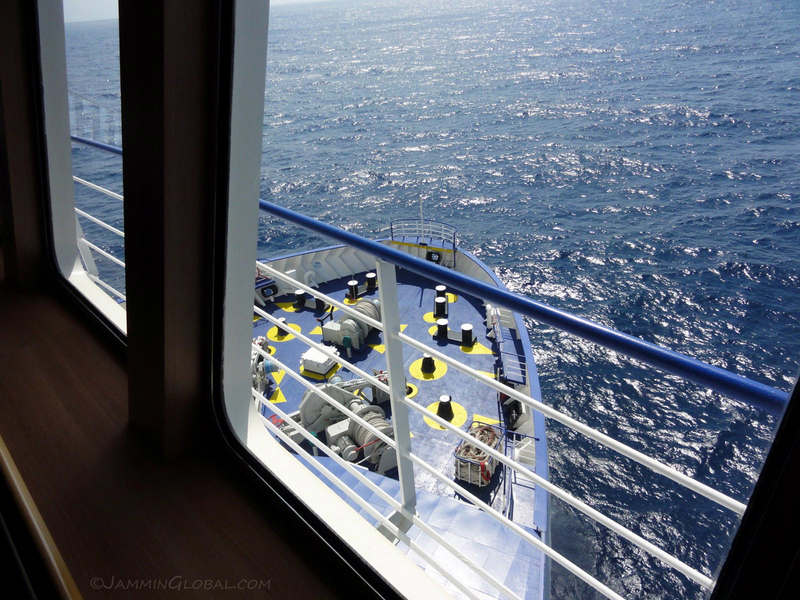 Our ship made a 360 degree turn as we neared port. I presume it was a sort of holding pattern until our dock was ready. As we headed into the port, it took a while before we realized what the strange object was that we were staring at on the horizon. 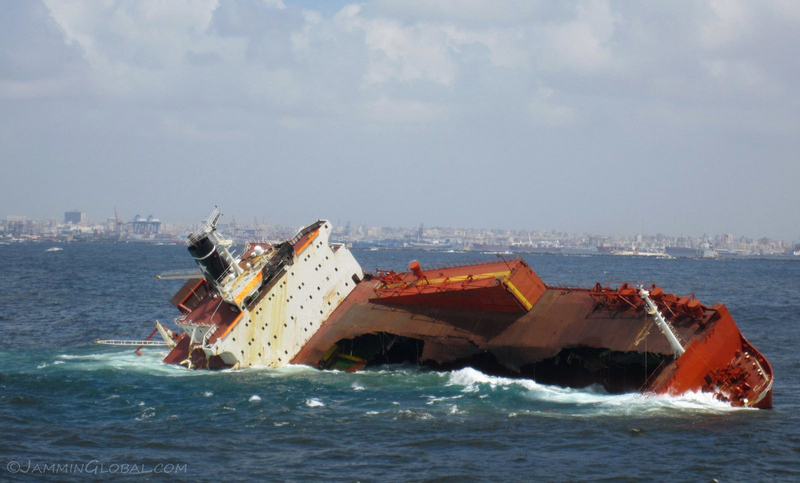 A ship-wreck in the shallow waters of Alexandria’s port. 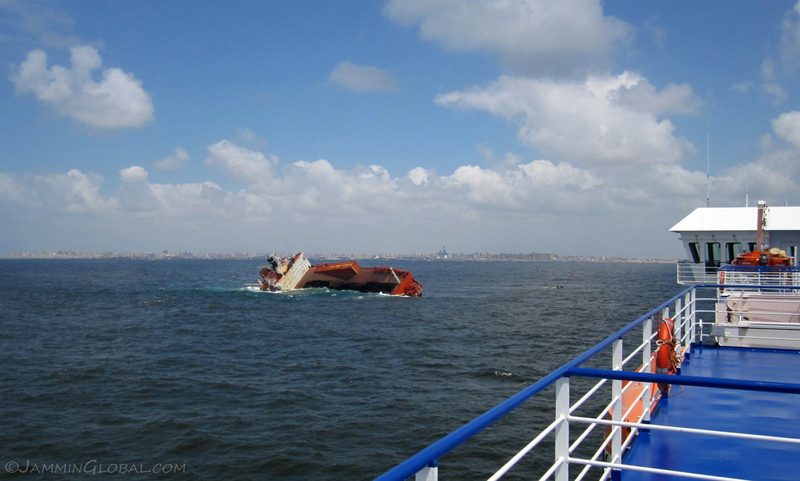 Not exactly the kind of thing you want to see as you arrive into a new port. 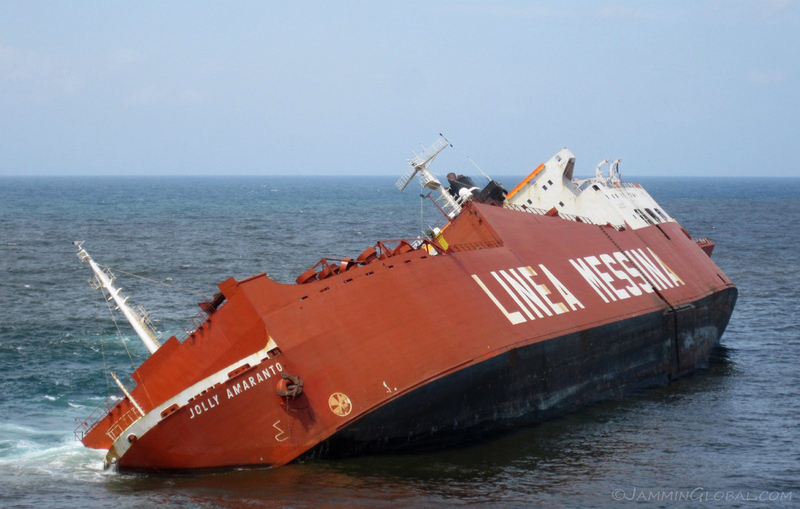 The sorry-looking M/V Jolly Amaranto from Linea Messina who met her fate just a few months back in December, 2010, when she got caught in a bad storm after an engine failure. 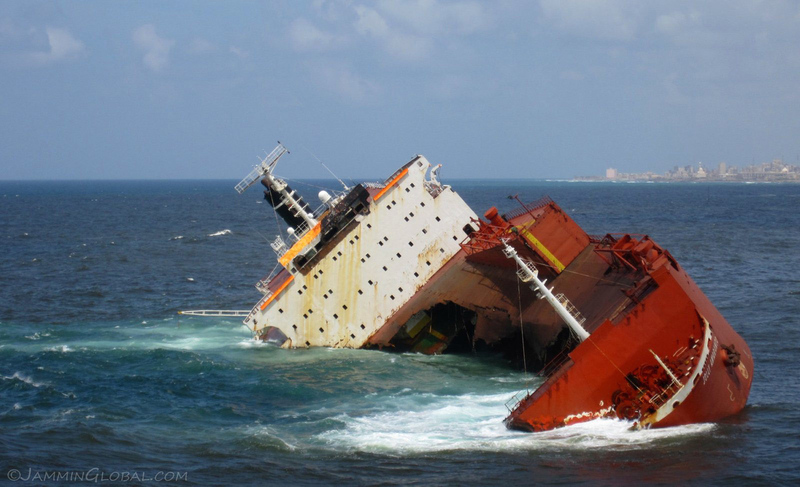 The vessel was carrying a dangerous cargo of paint in its containers, which slid off the ship as it listed into the sea. 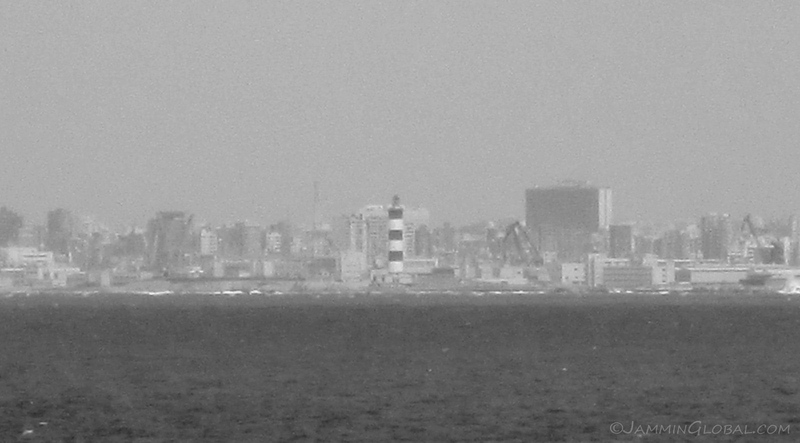 A shot of the Egyptian Navy’s frigates as we entered Alexandria’s port. A dirty ship framed by a labyrinth of a city that we were going to be riding through pretty soon. The Ras el-Tin Palace, built by Muhammad Ali Pasha in the early 19th century. It used to serve as a residence of the president, but now it’s used as a naval base. 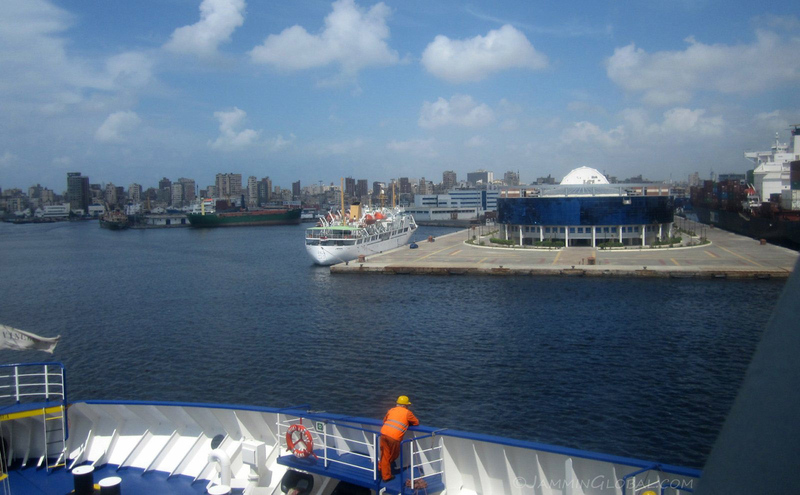 Coming in to Alexandria’s port and heading for the brand new passenger arrivals hall. 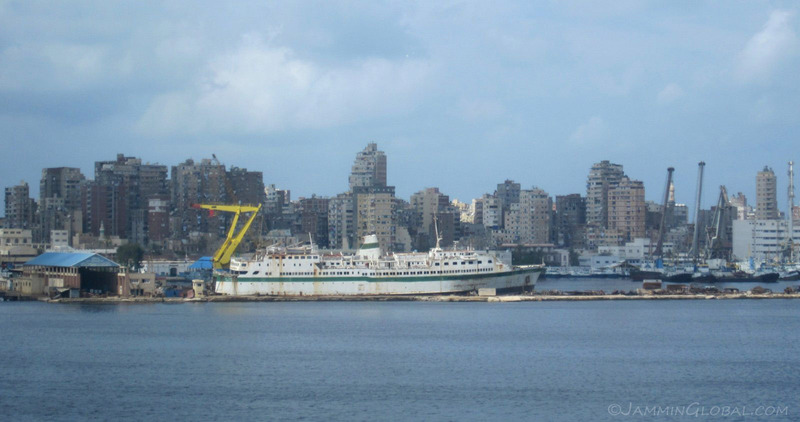 Alexandria’s port is considered one of the oldest ports in the world, first being developed in 1900 BC and still in use, almost 4,000 years later. 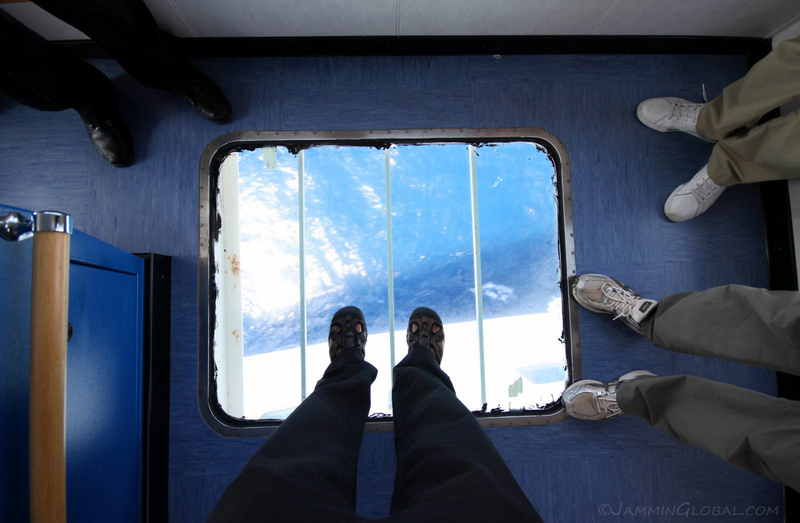 Positioning the ship to dock at the out of place glass-covered terminal, compared to the city that lay behind. 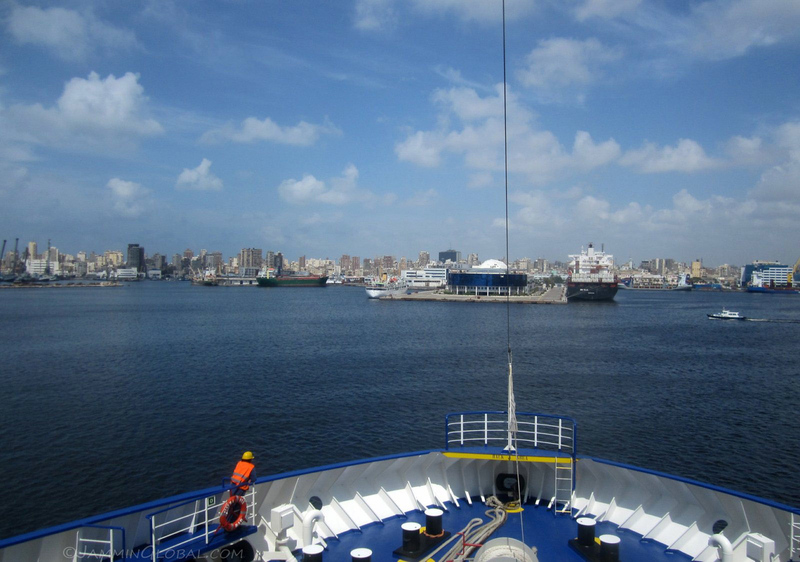 Docked at Alexandria and now the fun began of jumping through Egypt’s crazy bureaucracy and riding into Alexandria. 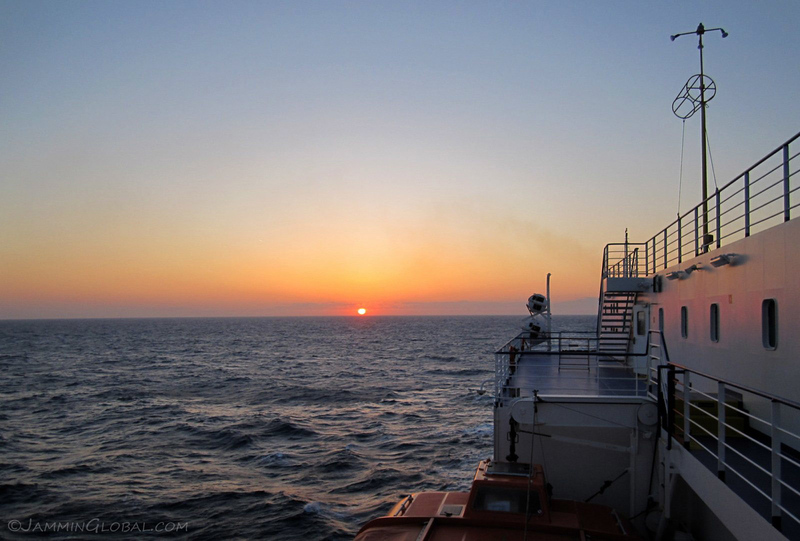 It was an easy three days out at sea and I enjoyed reliving a bit of my Atlantic crossing with Grimaldi. Ralph and Martijn were going stir-crazy with just these three days and they couldn’t understand how I enjoyed my four weeks out on the Atlantic. They were good company for the voyage and we shared notes on the road ahead. 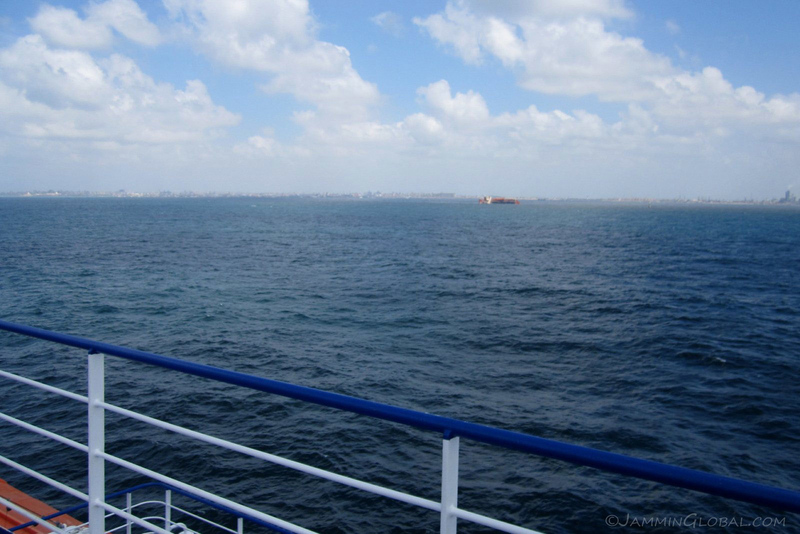 I was happy to have had this last option for entering Egypt as I heard travelers behind me had to scramble for different options after the Visemar One stopped plying these waters in a few weeks. 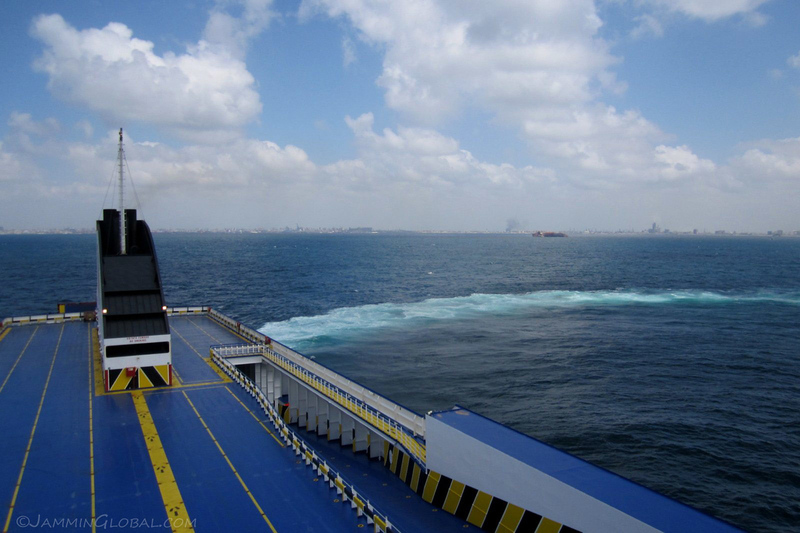 I hope service resumes again so that they can continue providing a link between the Middle East and Europe, via sea. 4 October 2011Got an article published on BikerCamps.com, a motorcycle travel website.